Does the maps app automatically insert itself into Quick Bible? You need to install both apps: Quick Bible and Bible Maps. 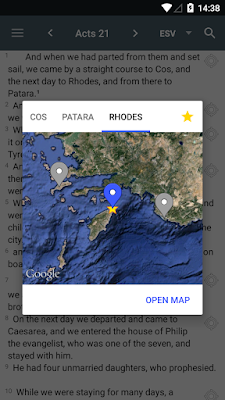 Then in Quick Bible app, you will find verses automatically annotated by the icon to indicate locations. Is this program also open source? Will you upload codes to the GitHub, too? The Bible Maps program is not open source. However, please write to me if you need it for something, and let me know what you try to do. Can we get Bible Maps for BlackBerry BB10? I've installed it through Snap, but upon launch it states Google Play services are required. Saya mau tanya apakah kalian juga membuat aplikasi Alkitab untuk Ipad? Karena saya suka sekali dengan aplikasi Alkitab for Android yg kalian buat..
Kalau ada, minta nama aplikasinya ya..